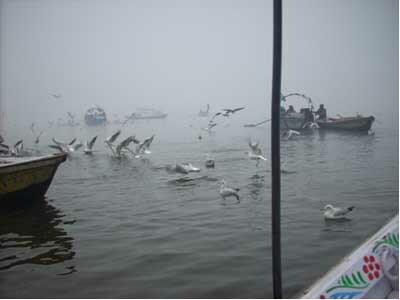 Winter is the best season to visit Allahabad. And there is no better way to experience the cold than to take a dip in the freezing waters of the Holy Ganges in the wee hours of the morning after spending a cold winter’s night outdoors. Prayag, which is at the confluence point of the Ganga,Yamuna and Saraswati rivers, is an ideal destination for relaxation and leisure, especially if one is brave enough to bear the extreme cold during the peak of winter. One can experience calmness, serenity, peace and tranquilness, as one boats along the placid waters at Prayag. Travelling on a hand-paddled boat, is the ideal way to relax. One moves at a slow and leisurely pace, the musical sound of the paddle as it touches the water at periodic intervals breaks the silence of the dawn. The gurgling sound of the flowing river, the chirping of sparrows and the squeaking calls of sea-gulls are all that one gets to hear at dawn. With every paddle, one gets closer to one’s destinstion and with every paddle, the darkness gives way to light. It is indeed an unforgettable memory. The biting cold, numbing one’s fingers, the icy breeze cuts through one’s face like. The anticipation of immersing oneself into the ice-cold waters at sun-rise, sends shivers down one’s spine. However, the boat ride rejuvenates one’s tired body and wearied mind. One of the most nature friendly spectacles at Prayag is to watch hundreds of migratory birds stopping over during their long migratory journeys from Siberia to India. 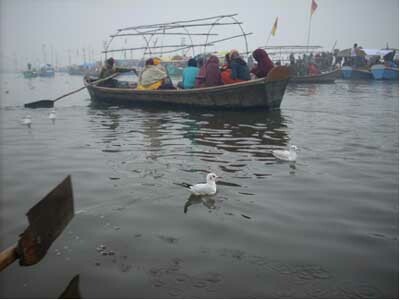 As one is enjoying the tranquil boat ride, watching the sunrise, hundreds of birds descend around your boat in minutes. These Siberian Geese start swimming in the waters in large groups, floating across the waters in concentric formations. A few adventurous one’s land on our boat and accompany us during our journey towards Sangam. The width of the waters at the confluence of the rivers is immense and one sees swirling waters all around. It is almost as if one is sailing in the middle of a gigantic lake or as if one is on a ocean cruise. Minutes turn into hours as one’s boat makes its way slowly yet steadily through the flowing waters. If one has to live in the present, there is no better way than to take this leisurely boat cruise at Prayag. The waters are covered in fog and mist and this makes the journey even more spectacular. 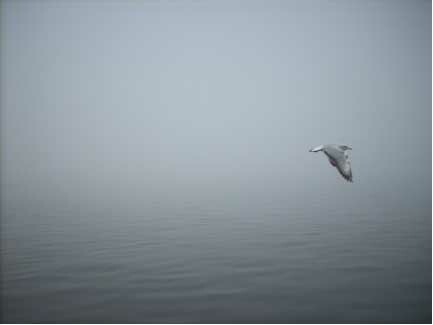 As one enters the boat in pitch darkness and dense fog, the first part of the journey exposes one to the eco-friendly sounds at dawn. The shrill cries of the gulls, the hum of the flowing waters, the buzzing sound of the icy breeze. The entire boat trip is hypnotic. One enters into a trance as thousands of geese land on the surface of the water in synchronicity and take off in unision towards the skies. These geese migrate to India for the winter from China. They are known to cover the distance from China to India in one flight. They generally fly at a speed of around 40 miles an hour, so, assuming no wind, a goose will cover the 600 miles to India in about 15 hours of non-stop flight, enabled to do this by flying in formation. It is a pleasure watching the young geese swimming behind their parents in small groups. Soon these small groups merge into the larger whole. The shrill cries of the geese breaks the morning air as they make their way towards the skies on seeing the appearance of the sun. There is a magical connection between the appearance of the sun and the flight of these migratory geese! The sun is greeted with the chirping of sparrows and the musical sounds emanating from winged crooners who have made the thick groves that surround the rivers. Watching life in slow motion aptly describes my early morning cruise from Prayag to Sangam. The journey lasted for a few hours but its memory will last a lifetime. The biting cold and a dip in thse freezing waters in the wee hours of the morning made it more memorable. One beats the cold by sipping lukewarm herbal infusion made with ginger and basil. This unique combination stimulates the immune system and one becomes more energetic and active. Being a vegan who does not consume any products of animal origin, there are lots of options at Prayag. Boiled green peas lightly spiced and served with squeezed lime is available at the boat jetty. Boiled sprouts with freshly cut vegetables and peanuts are available everywhere. Small make-shift carts selling roasted baby potatoes are also an option for strict vegans. There are lots of boats parked at the jetty, but most of the activity picks up after 10:00 a.m. in winter. There are few boats that venture out at 5:00 a.m. in mid-January. Indian Airlines operates daily flights to Allahabad from New Delhi, Kolkata and Mumbai. The to and fro drive from Allahabad to Prayag costs approximately Rs.200/- by jeep. Shared taxis are available on the return trip to Allahabad (Rs. 20/- per seat). Small rowing boats are available at Prayag to take you to the exact location of the Sangam, where the rivers meet. The two-hour to and fro boat ride costs Rs. 300/- (to charter a boat). There are several budget hotels near Allahabad Railway Station. Hotel Raj is a comfortable place to stay. It offers minimum but clean and comfortable rooms to stay. After spending three weeks at Leh, I came to know about the sulphur springs at Panamik, which offered miraculous cures for arthritis, digestive ailments and skin diseases.